In the not-so-distant future, a catastrophic event has turned the old capital of Japan into a wasteland, forever changing the lives of its people. Decades later, three schoolgirls set foot into the now forsaken city. 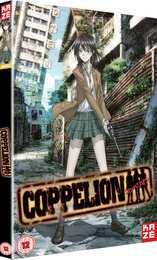 They are the Coppelion, genetically engineered humans created by the Japan Ground Self-Defense Force to operate under the lethal conditions of the contaminated city. Trained since birth, the girls must use all of their skills and resources to carry out their one and only mission: to rescue those left behind.